Jeffrey Welch's Blog: Is “Hard” Drinking Water Hard On Dogs? Is “Hard” Drinking Water Hard On Dogs? Could there be a link between drinking water and your dog’s urinary problems like urinary tract infections, cystitis (inflammation of the bladder), urinary obstruction, and crystalluria (crystals in the urine)? 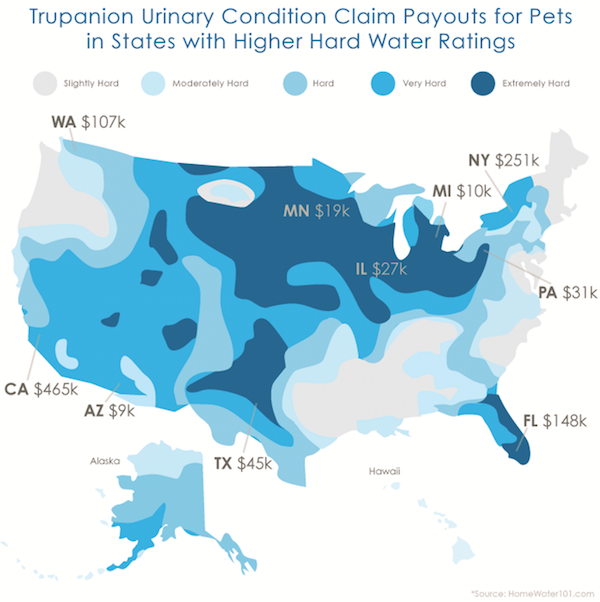 Pet-insurance provider Trupanion recently analyzed data from its insurance claims to test a common theory that drinking water could be a potential factor for these common urinary issues. Using data and reports on drinking water quality, Trupanion compared its claims data for urinary health conditions to U.S. regions identified by the Environmental Protection Agency as having higher hard water ratings. Although Trupanion’s analysis of its claims data has not been published in a peer-reviewed journal and more research is needed, it seems to suggest at least a link between hard water and urinary problems. For more details, visit the Trupanion blog. The post Is “Hard” Drinking Water Hard On Dogs? appeared first on Dogster.